Reuters is carrying the story of the cut-off of gas that Russia is supplying to the Ukraine. However, since the gas is a part of that being shipped to Europe it appears that the Russians dropped the supply to Ukraine by 120 million cubic meters a day (the Ukrainian use) but that when the gas leaves Ukraine for Europe it is being reduced by 67 million cubic meters. In other words the Ukrainians are still drawing out some of the gas for their needs. Since the Russian government is likely to expand this policy to other countries that have left their sphere of influence, this could be the beginning of a whole new set of political realities. And it is a set where Western Europe and the United States, since we do not have the reserves, will be unable to help much. UPDATE The New York Times points out that it is not only Ukraine that is involved. The dispute comes a year after the Orange Revolution brought a pro-Western government to power in Ukraine, and ends a decade of post-Soviet subsidies in the form of cheap energy that allowed Moscow to retain some influence over the former Soviet republics. At the heart of the conflict is a jump in Moscow's utility bill for Ukraine: Russia is now asking for $220 to $230 per 1,000 cubic meters of natural gas, up from $50 now. Ukraine's economy has depended on buying cheap energy from Russia. From the very beginning the Ukrainian authorities had plans to begin to use gas without permission from January 1," said Kupriyanov. "To be more precise, they planned to start to steal gas -- steal it from European consumers." Ukrainian officials have sent mixed messages about their intentions. Yushchenko has said that supplies to other European countries would not be affected by the dispute, but Ukrainian Prime Minister Yuri Yekhanurov said his country was entitled to 15 percent of the gas crossing Ukraine as a transit fee. Even if we had surpluses, we couldn't help much, could we? Does the US have the refrigeration plants and transport to carry LNG to Europe? We get about 1% of our gas as imported LNG and it's going down as we get outbid. We only have LNG evporators for imports, not liquifiers for exports. The Europeans will substitute heavy oil for gas for heating and power peaking and steam generation, which will increase the price of oil. They will pay for the oil by selling US treasury bonds, which will decrease the value of the dollar in comparison to the euro. Which will hurt our imports and help our exports. Expect to see a lot of Europeans visiting America in search of cheap vacations, retirement homes, college educations, medical procedures, etc. I can just imagine V. Putin sitting in the Kremlin with a big cigar, chuckling a little and saying "I hope your little Western style democracy will keep you warm at night"
Energy, especially Natural Gas, is a regional trump card that we will see played time and again. Russia's NTV television -- owned by Gazprom -- quoted Alexander Nemudrov, a Gazprom official at a pumping station in Slovakia, as saying gas flow out of Ukraine was already falling. That suggested Ukraine was making up for its shortfall by drawing gas intended for other countries. Gazprom officials in Moscow said they would not know definitely if that was the case until later on Sunday. Gazprom said gas deliveries to western Europe would not be disrupted, unless Ukraine covered its own shortfall by siphoning off transit supplies being piped westward across its territory. Russia flexes it's power. The US must react. CARACAS, Venezuela (AP) - Venezuela's state oil company said yesterday it has successfully signed agreements to bring all 32 privately operated oil fields under government control after reaching a deal with Spanish-Argentine oil company Repsol YPF. How important is this? Notice you will find Nothing about this in the US MSM. Or that 40% of oil/gas GOM production is still shutin and offline. The Ukraine is not taking Russian gas. They take fifteen percent of the gas for transportation across the Ukraine through their pipeline. You know, to operate the pumping stations to keep the gas flowing. You cut the flow by ten percent, they cut the offtake by fifteen percent. You cut the flow by fifty percent, they cut the offtake by fifteen percent. Russia wants to increase the price to Europe and blame the Ukrainians, and is doing that now. Russia figures to boost the price of the oil to make up for the loss of natural gas going through the Ukraine. Russia previously renationalized the oil industry to make sure they got the increase in oil prices. But what the Ukraine is doing is to cut off the supply of gas to the factories in the eastern, Russian speaking part of the Ukraine, which are owned by the Moscow types, instead of cutting off natural gas to the consumers in the Ukraine as a whole. I just find it hard to believe that if you push gas into a pipeline it won't come out the other end simply from the insertion pressure. Does it get stuck? More or less, yes. It's called viscosity. It has by accusing Russia of assorted nefarious motives while at the same time not making a single squeak about blatant Ukrainian thievery. The US then expects Russia to supply it with LNG and complains that there isn't enough investment in Russian oil and gas production. Why should Russia do anything for the USA? The US walks and talks like Russia's enemy and at the end of the day it is Russia's enemy. The US doesn't want Russian LNG as far as I know. Please cite? U.S. LNG receiving facilities are only operating at 50% of capacity, because of a global bidding war for LNG cargoes. At present, world spot LNG prices are higher than Gulf Coast spot prices. "In an extreme example of the situation, a tanker carrying liquefied natural gas last month arrived from Nigeria and idled in the Gulf of Mexico for a week -- during which prices soared in Europe - before sailing to Spain to unload its cargo. Recently, the Spanish have been willing to pay $2 to $3 per million BTUs above Gulf Coast spot prices, according to PIRA Energy Group, a New York consultant. South Koreans, meanwhile, are paying a premium of about $2 and the British a premium of $2 to $6." We certainly live in "interesting times"
The Russian state monopoly Gazprom said it had cut supplies to Ukraine by a quarter -- the level of Ukraine's own imports -- after Kiev refused to sign a new contract requiring it to pay four times as much. Ok, reading a little between the lines Russia is basically saying: "Now that you're not our good friend anymore, we're not going to subsidize your energy supplies any longer." Of course here in the US, charging 4x more overnight is considered highway robbery, no matter what the history of that "price" or the other intangibles that were exchanged as quids to support that price, so we shocked and cry foul at the free market replacing old client state relationships. Though Russia says it is purely a business dispute, the row has fed concern that the Kremlin is prepared to use its vast energy resources as a political weapon.Ukraine's Western-leaning president, Viktor Yushchenko, has irked Moscow by trying to take his ex-Soviet state on Russia's western border into NATO and the European Union. Ukrainian officials say that is why the Kremlin is punishing Ukraine with such a huge price increase while letting more Moscow-friendly ex-Soviet states such as Belarus pay far less. It's already an interesting year. As far as I can see, the Russians have all the leverage here. The fundamental problem is Russia supplies so much gas to Europe that by restraining output they will probably increase their revenue rather than reducing it - given demand is going to be very inelastic in the middle of winter. So if Ukraine dips into European gas in transit, the effect will be to increase Russian revenue due to resulting price increases, but bring all the Europeans to exert pressure on the Ukrainians to cut a deal. The Russians will be laughing all the way to the bank until Ukraine agrees to the terms. Sure the Ukrainians can raise the rent at the port, but what's their leverage to actually make the Russians pay it? How do you evict the Russian navy unless it agrees to be evicted? No-one has anything the Russians need more than Europeans and Ukrainians need the Russian gas. So Russia sets the terms of the deal. The only other possibility is military threats, and since the Russians still have quite a few nukes, that probably isn't going to get too far either. I'm expecting to see this settled after a flurry of negotiations, and the terms will not be too far from what Russia is asking for. I think your analysis is probably close to what will happen this time, but don't underestimate the poor hand that a landlocked supplier has to get their goods to market. Ukraine could (in theory) completely cut supplies to Europe and Russia will have to stop production since it has no way to bring its product to the EU market. Ukraine can play the same game with the EU, saying that Russia's unreasonable demands are what are forcing it to cut supplies to the EU. The critical piece is how long the Ukraine can hold out without stealing gas from the pipeline and it seems they already are. They didn't prepare well for this round, but there will be more. If Russia builds a pipeline through Belarus, then Ukraine could be literally left out in the cold. Actually, there is the "Yamal-Europe" pipeline through Belarus and Poland, but the plans for doubling its capacity have been postponed, probably indefinitely, due to the construction of The North European gas pipeline. This pipeline is planned to connect Russia and Germany under the Baltic Sea, bypassing both Belarus and Poland. According to wikipedia most were returned to Russia, but they are suspected to have a few hundred that are not operational. Ukraine - signed the Nuclear Non-Proliferation Treaty. Ukraine inherited about 5,000 nuclear weapons when it became independent from the USSR in 1991, making its nuclear arsenal the third-largest in the world. It transferred all of these to Russia by 1996. However recent news has surfaced that due to a clerical error, Ukraine may still possess several hundred warheads which were not accounted for in the armaments repatriation move 14 years ago. In any case, even if Ukraine does possess these weapons, they are technically missing and not in a deployed state or any part of Ukraine's defense posture. I'll go out on a limb and just say that 99% of the time I find Wikipedia to be a good first source of information. Of course it has it's issues, but so does every information source. as you said it's a "good first source", if you know next to nothing about the topic. but to call it the "official story" is rather naive, given it's poor handling of many controversial subjects (e.g. depleted uranium, Central Banking and The Fed, nature of corporations). why should i trust it to tell me where the Ukrainian nukes are? there is no accountability (at least there is someone to blame for corporate-fed reporting in NYT, WSJ, etc.) and any person can write whatever is "acceptable" to the amorphous "editors" of Wiki. i have found quite a bit of selective source inclusion/exclusion going on over there and uncited use of government propaganda. isaiah, I understand all that, but based on all else I found, Wiki was the best summarized and most succinct abstract on this very specific topic. And when I said "official story", I meant that there was probably much more to this issue (e.g. I bet the Ukrainians have a small nuclear deterrant), but without any other information to the contrary that has to be the story until more facts emerge. I invite you and others to explore this topic and research it in more depth. The Russian navy has to get water, fuel, supplies, whores, etc, from the port. The Ukrainians just shut down refuel, resupply, and recreation. My drink is now on the screen! Ukraine has a contract with gazprom through, I think, 2013 for gas at $50/mm3. They think this is binding and would be upheld at the Hague. The other part is their 15% transit fee, part of the same contract. Until the Russians no longer need the pipeline, Ukraine can simply fulfill their contract from what passes through their territory. Heaven forbid they pay the actual price of natural gas! Anything but that! As Francois pointed out on Friday, the Ukrainians claim to have a binding contract on which the Russians are trying to renege. "During the period between 2005 and 2009 the Customer (Gasprom) will sell annually natural gas at the price of 50 US dollars for 1000 cubic meters, which is not subject to change by the parties, from the gas transportation services of Russian natural gas through the territory of Ukraine to ensure the gas balance of Ukraine." It is just that, a claim. The contract stipulates annual renegotiation of the prices in the contract. There is no fixed price for both the gas and the transit fees for this four year period. Come Sunday, Pacific Gas and Electric Co.'s residential customers will see, on average, an 11.1 percent increase in the price they pay for electricity. The increase in their natural gas costs will be worse. Those are expected to soar in January to levels 43.4 percent higher than they were a year ago, extending a three-month run-up in gas prices. They were a Soviet block country with 460% off natural gas prices via subsidies from Russia. Now they go and bite the hand the feeds them by overthrowing the puppet government and saying they want to be part of the EU. Dream on little retards, you can't afford to be part of the EU. Ukraine has been busy reselling cheap Russian gas to its neighbours like Romania for $240 per 1000 m^3. So they are going to be hit a bit harder than the price difference suggests. But Ukraine's GDP is big enough to absorb this loss. Then why didn't they agree to phased-in price increases? Or is Russia lying about them not agreeing? Russia was initially asking for $160 per 1000 m^3. But Ukraine insists on no more than $80 and a four year phase in period. If Ukraine can find enough gas to resell then it can live with less for more. Gazprom ain't no charity. Well they are a charity to their allies which Belarus still is. Belarus and Russia are moving to a union state. So Belarus gets Russia's domestic price. Georgia and Armenia are too poor to be charged $240. Ukraine isn't so poor. Gazprom is now accusing Ukraine of tapping the supplies. This is going to get messy, and have a potentially large impact on the EU. In light of Europe selling treasury bonds, this is not good following John Snow's comments that the US govt doesn't have enough cash to run past February - mid-March. This crisis highlights the need for energy self-sufficiency, and also the spiralling costs of natural gas making it unsuitable for heating and electricity production. I've posted my thoughts about the situation at Earth Sentinel, my site dedicated to finding solutions to peak oil and climate change. Read down for two excellent arguments for supporting a nuclear/hydrogen economy. How do we trust Gazeprom isn't cutting off the Ukraine and messing up Western Europe to make the Ukraine look like thieves? Scoundrels all. EU nations have started to feel the impact of Russia's axeing of gas supplies to Ukraine, as Moscow accused Kiev of stealing EU supplies. THis was hard to dig up but I found the rate for Poland: $190-200. Poland was heavily involved in the "Orange revolution" backing Yushchenko's side. This created a bitter dispute with Russia and it will be interesting to see whether gazprom will insist on bumping that rate as well. Although a hike of $40 dollars is unlikely to have as big an impact on Polish economy as quadrupling the prices would for Ukraine. Meanwhile natural gas goes for about $390 per 1000 cubic meters in the USA. Russia is still asking too little for this finite and quickly depleting resource. Ukraine is the biggest consumer of natural gas per capita in the world. Instead of demanding gas for a trivial price they should focus on conservation and adoptation of new technology to replace the obsolete equipment they use now. $390? I can see that Henry Groppe is right when he said the United States was predominantly influenced in the last 100 years by the availability of what appeared to be almost limitless supplies of oil and gas available at very very low prices. For the bulk of that time being the world's most highly developed economy with the lowest energy costs in the world. In a relatively rapid transition in the several years we're moving permanently to a position in the world of having the highest energy cost. Greetings from Ankara, Turkey, where I pay 0.411 YTL/m3 for home use natural gas, most of which comes from Russia. It translates to slightly more than US$300 per 1000 cubic meter. What is the price the Russians charge? That's a difficult question, and the answer may very well be top secret. The issue is that Turkey receives gas via two pipelines, one crossing Ukraine, Romania and Bulgaria, and the other, "Blue Current" that crosses the Black Sea. The price of natural gas depends on which pipeline it crosses, and some other factors. The Germans started construction of a pipeline through the baltic sea, much to the anger of Poland, Belarus and the baltic states which are bypassed. The Austrians, with help from the Hungarians and Rumanians are pushing for a new pipeline to IRAN. The project is called Nabucco. So for the Russian side, this might be a window of opportunity, as long as the Ukrainian route is the only viable one. This business between Russia and Ukraine could affect the UK at exactly the wrong moment! The forecast for this coming weekend (including Friday) is cold and snowy. Seeing how bad an effect cold weather had during the low demand Christmas week I expect similarly cold weather during a normal working week will cause disruption. The Russia/Ukraine thing can only make it harder for UK to import gas - even if it's there, the increased risk of it not being might make the Europeans reluctant to sell to the UK. I've written about it in more detail here: It was cold, will it be cold when it matters? We in the UK are last but one in the chain. It is the Irish at the very end who will suffer most. With our North sea production falling below consumption and only the start of a system to import LNG, if we do not receive gas from the interconnector pipeline between Bacton, England and Zeebrugge, Belgium then it is unlikely we will supply any to Ireland along the interconnector running from Moffat, Scotland to Dublin. This Russian blackmail is meant to influence the upcoming Ukrainian parliamentary elections in March. I would say this generally makes Russia an unreliable energy supplier. This lesson will not be lost on the Europeans even if they do gang up on the Ukraine in the coming week. Can't wait for that next G8 summit due to be held in the first half of July 2006 in St. Petersburg. Russia on Sunday took over the presidency of the G8 group of leading industrialized nations for the first time, saying it wants to use its one-year leadership to stimulate a global dialogue on energy supply, state news agency RIA-Nowosti reported. You know, guys, I know this is a serious situation and all that but right now I can't stop laughing! Russia doesn't have to prove anything to the west. The west can take its gas or leave it. You just can't stand the fact that Russia will get a good price for its hydrocarbon fuels instead of joke prices like $50. It is time for Russia to set the rules: all gas sold should be at the border and it is the responsibility of the consumers and the transit countries to provide for the transit. If Ukraine wants to siphon gas destined for other consumer countries then it is not Russia's responsibility. Laugh all you want. Dissident, I believe you meant to say "take its gas or pay for it anyway." The phrase I always see used in reference to Gazprom-related contracts is take-or-pay, the idea being that there must be a strong incentive for the customer to actually take a certain quantity of gas consistently over time in order for Gazprom to justify capital-intensive projects. The strong incentive is a contractual guarantee that money will end up in Gazprom's pocket whether the customer takes the gas or not. Or perhaps you have some other understanding of how Gazprom's contracts work? That's funny. Give me an example where any of Gazprom's consumers are paying for no gas. You are crying about standard contract terms that you will find in the USA. Gazprom is being too generous with the Baltic states. They are going to be charged $125 per 1000 m^3 close to the rate for impovrished Georgia and Armenia. This price is a total joke. Take-or-pay is only a contractual provision. To my knowledge, only one customer came close to having to pay without taking delivery (Turkey), and that was a few years back. I seem to recall Turkey managed to take delivery, so the provision was not actually applied. As indeed it shouldn't have to be, in a normal situation. "Crying"? Hey, wait a minute -- I'm on Gazprom's side, as far as the price formula being applied here in Lithuania. I agree, $125-$140 per 1000 m^3 works for me. I posted on this in another thread, started by Yankee, some days ago. I don't see Gazprom's price charged to Lithuania as being particularly political...the formula relies on market prices at Rotterdam, Antwerp, and Amsterdam, if I recall correctly. Dave, they are exercising their power in what they believe to be their best interests, without much regard for who gets hurt. The US is hardly in any position to make a fuss about that. Hell, at least they're not bombing anyone. They have the energy and the military to allow them to do what they want. What is anyone going to do about it? We've got the military, and we'll try to use it to take energy from those with energy who we perceive are too weak to fend us off, but Russia will not be one of them. In fact, it appears that we cannot even take oil from Iraq - oil infrastructure appears to be very vulnerable. This reminds of a question I have been thinking. Is the US using Iraqi oil? I mean all of it? How easy would it be to pull this off? With all the problems lately, our supplies seem to be above normal and prices are still pretty cheap. This might also explain why the US neocons (Chalabi) are pushing for higher prices in Iraq, it would lower the costs of Iraqi exports even more. Not according to the US. First what is "all of it"? Nobody knows exactly. Nobody has definitive numbers on Iraq's oil production, but analysts say daily production this year will average about 1.8 million barrels per day, about 10 percent less than 2004 levels of about 2 million barrels, and just over half 1990 levels. I've heard that theory a couple of times now. I'd be willing to believe anything along those lines - I've got no trust at all for what is officially reported. But I also read that the insurgents are probably doing a more effective job of taking out the oil infrastructure in Iraq than is generally reported. So we are left trying to dope out the truth, which could be anywhere from the US pulling out large amounts of oil in secret to the oil output being mostly shut down. And the shame of it is that we can't get the truth. Just bfore the war started in 2003, the US was getting 80 to 90% of Iraq's exports. There is no reason to think this has changed much. So if production figures are correct, and it is not coming to the US, where is it going? Perhaps this is why the oil markets seem to have less supply than indicated by the production figures. Well, that was my point - I've no faith that anything I hear from Iraq is correct. Not that I believe much about anywhere else either. What is the source of our data on Iraq oil production? In light of current developments does the Russia/Ukraine/EU natural gas chain even come close to resembling a 'market' in the normal sense of the word? To have a market, don't you have to have at least two or more competing suppliers and two or more consumers who have a real choice in doing business with any or all of those suppliers? In the Russia/Ukraine/EU natural gas chain we have, for the most part, a single supplier - Russia - and a number of consumers who have little choice but to deal with that single supplier. This is a market only in the sense that if the Ukraine and the EU countries agree to pay a high enough price, and if they don't do anything to further piss the Russians off, then maybe Russia will open up the spigot. I agree with the previous poster who said that this situation perfectly fits the definition of 'extortion'. I fear this type of situation will become all too common in the year ahead. against humanity. Russia only supplies 25% of the EU's gas so the point about "single supplier" is rather hollow. Russia supplies 50% of EU's natural gas. "The European Union as a whole gets around 20% of its gas from Russia..."
Some has to be coming from the North Sea and that is being depleted so is the BBC using current data or 2002 data? How much of the $390 is due to the cost of natural gas liquification? I am using the domestic US price. I don't think the US would be a gas exporter at this rate and there is little reason to believe that the current gas prices would fall much below $7 per 1000 cubic feet in 2006. But (1) Russian Gas imports to the US started in September 2005 and (2) gas from Russia to the US must be liquified at extra cost. It's not the sole supplier for Ukraine either, but if nobody's there to supply Russia's part of the pie, they may as well be a sole provider. Comparing the US price of natural gas is irrelevant. Unlike oil, natural gas markets are still fairly regional, significantly limited by the lack of pipelines, LNG facilities & LNG ships. We are almost entirely consuming natural gas from the Americas, not Russia. Basically, it is not like Russia could turn around and sell Ukraine's gas to the US for 390$, so that should have no real bearing on what they sell it to Ukraine for. (by the way, does anybody have ng prices for the ME? I suspect they would further reinforce the still regional aspects of the natural gas market). But that's not the most important point. The most important point is that Russia's actions are clearly not motivated by selling natural gas at market prices. First, they just renewed a year contract to sell NG to Belarus (Russia's pawn) for 47$. Second, Gazprom is not a capitalist entity. It is an oil behemoth wrought and controlled by the Russian government, thus more subject to the forces of politics, not the market. It is thus a government sanctioned moneopoly, another tick against capitalistic justificaitons for its actions. Third, Gazprom just bought thrice its normal portion of Central Asian gas in a blatant attempt to deny the Ukraine an alternate supply. Gazprom... "tightened the screws on Thursday by agreeing to buy Central Asian gas that would normally have gone to its neighbor." The Ukraine consumes 80 some billion cubic meters, and Russia has then not only cut off their own supply, but bought up an additional 20 bil. that the Ukraine might have used to compensate for the cutoff, effectively making itself the sole provider. This seems to be an important part of the story that has been entirely neglected, and although I am still curious as to what price they purchased it for, I think it effectively seals the case that this is not simply a matter of Gazprom demanding a fair price. This is Russia attempting to do harm to Ukraine. The price is determined by what the market will bear. Russia has been setting a low price for various political reasons like good relations with the EU, etc. Belarus should never have been an independent state. There are more linguistic, cultural and racial differences in the UK. Belarus and Russia intend to merge together again so Belarus gets Russia's domestic rate. Maybe you should whinge about the Baltics getting it for $125. Naftogaz of Ukraine is the same sort of state owned monopoly and I don't see you complaining. Ukraine is setting the tone with its hardball tactics. There is nothing wrong with Gazprom taking measures to secure its interests. It is interesting how the current blatant theft by Ukraine at the rate of 100 million cubic meters a day is not of any concern in the halls of western power. Instead demands are made on Russia to guarantee this and guarantee that. Gazprom has no obligation to guarantee anything in the face of brazen thievery by Ukraine. Russia is blatantly renegotiating it's gas price, then whining when the Ukraine blatantly renegotiates it's transport price. Russia quadrupled it's price of gas and the Ukraine quadrupled it's price of transport. But Russia will win, because unlike the Ukraine, Russia has oil. Russia will stop shipping gas and start shipping oil and the loss of the gas will make oil prices go up, and Russia makes out like a bandit. Instead of selling gas for the equivalent of 4$ a barrel, it will sell oil at 80$ a barrel. For Russia, it's great. Until the Chechnyans blow up the oil pipelines, that is. Application of ASPO's Energy Depletion Protocols and Jay Hanson's eMergy certificates [see dieoff.com]would have allowed an easy Thermo-side mitigation solution to this natgas dilemna. The instant leveling of natgas demand across Europe and northern Asia would have precluded the 'last man standing' detritovore process that will now intensify. The Thermo-Gene Collision will now assert the other half of the equation to maintain and/or accelerate decline momentum. The Gene-side will inevitably result in Genocide. Recall the Russian induced Ukrainian famine of the 1930s, then extrapolate to our modern world. The naked ape has chosen the course of power versus cooperation as the future modus operandi. Out come the revisionists. The early 1930s famine wasn't confined to Ukraine. There was famine all the way to Kazakhstan. The result of Stalin's forced collectivization policy and the resistance to it (i.e. burning of crops and killing of livestock by farmers facing seizure of their hard earned farms.) The story you peddle is concocted by western Ukrainian nationalists. Western Ukraine was part of Poland between WWI and WWII so it didn't live through the famine. Whereas the Russian populated eastern Ukraine did. So much for the Russians vs. Ukrainians fairy tales created by people who fell over themselves serving in the SS for the Reich. I basically agree with your assessment, but it does not negate my argument of elite power assertion riding roughshod over a mutual Powerdown cooperation. This is the typical entropic course of historical humanity as we instinctively fight for resources. This will result in the fast-crash versus trying to create a gently declining Hubbert Downslope. Well, you know, maybe yeast aren't so dumb after all. They respond in a rational way to various stimuli, they obviously know what's good for them, and they don't exhibit overt self-destructive behavior. So, perhaps in the grand scheme of things, in the long run yeast may have better survival traits than the human race, which looks to be quite anxious to destroy itself. I don't think you've ever made beer.A few yeast , malt sugars,etc. ; incredibly growth of yeast and in a few days the beer is brewed when there is a massive crash dieoff. So many dead yeast you have to siphon the beer or ruin it's flavor.Of course we value the result. Yes a few yeast survive. Well yes, yeast can get a little overenthusiastic when there are lots of goodies to be gorged upon, yet I don't think they purposely and maliciously try to screw each other. But not being a yeast spore, how would I really know? Anyway, algae on the cold dark side of the rock will naturally try to migrate to the warm sunny side of the rock. And, metaphorically, so it is too with humans. People will naturally tend to migrate from squalor to prosperity, from hunger to plenty. It's almost like an electrical potential: the greater the wealth-to-poverty differential, the greater the driving force for something extreme to happen. And when that potential is discharged: look out! But is the population crash due to resource depletion (no more simple sugars) or due to poisoning from the byproducts of consumption (alcohol)? Depends on the quantity of fermentables the "creator" of the brew puts there in the first place. Most people don't like a very sweet beer but the brewer might choose to test the alcohol tolerance of the yeast for a sweet wine or mead; in this case the population collapse is more drawn out. In our case we clearly have the potential to face a collapse which stems from energy starvation, or from the byproducts of our consumption, or both. Finding a steady state solution without a population collapse looks pretty unlikely at this point unless the brewer intervenes. Serendipity doo dah. Serendipity ay. Wonderful feeling. Wonderful day. Speaking of cooperating with the Reich -- is that what Molotov was doing when he signed that pact with von Ribbentrop? There is a dangerous fairy tale afoot nowadays, propagated by some in the Putin administration, that the occupation of the Baltics never happened, and that in turn is based on sweeping the pact under the rug. Get off the crack. It is clear from my post that I know of the Ukrainian famine. I also know that Russians were by far the biggest victims of Stalin and the Bolsheviks. Unlike you I don't turn it into "only we suffered" propaganda. while US based corportations shipped them oil) then why was the USSR preparing for a war? they still extoll their SS participation by holding regular SS veterans parades. Ah, very good. Then you do acknowledge the Ukrainian famine, the occupation of the Baltics, and other historical events. Just wanted to make sure. No SS veterans parades around here. Had some great fireworks on New Year's, though! Perhaps you're referring to an annual parade in Latvia? Actually, to get back to the subject of the thread, I suspect we're in agreement -- Gazprom's price increases should not be interpreted as an across-the-board political gesture. There's plenty of economic rationale behind them. Perhaps we can agree on that? Funny how Ofgem thinks that cracking the whip will make more gas magically appear. Shows how clued out governments are about the fossil fuel situation. Cargoes bound for the Grain terminal can be diverted if a better price is offered by other countries. S'funny the US pays $390 a unit. Gazprom said its first LNG tanker had arrived at the regasification terminal in Maryland in September under an agreement with Shell Western BV and BG Group. An agreement on the second tanker, which arrived in the U.S. in December, was signed with Gaz de France, MED LNG&Gas and Shell. Thanks to Gazprom, there's yet another commodity which will cross the Kaliningrad-Lithuania border in all kinds of amazing ways, in order to exploit the huge, huge price differential between the Russian Federation (including that military base on steroids, Kaliningrad) and the EU (including Lithuania). Used to be sugar -- you'd see lines of hundreds of people, trudging across the pedestrian bridge over the river separating Kaliningrad from Lithuania. Then gasoline was fashionable. Lately it's been cigarettes -- frogmen have been captured, swimming over, dragging unbelievable quantities of cigarettes in waterproof containers. So, how do you get natural gas from Kaliningrad (which, incidentally, has to pass through Lithuania anyway first) back to Lithuania? Any enterprising engineers who can build a covert pipeline under the river, for example? Sending out CF lightbulbs full of mercury to children is not my idea of a bright idea. Please realize that a CF light bulb is not a toy. But the "Luna's bright idea" is asking for them to give children CF lightbulbs. Surely that's the wrong people to be giving them too. They don't pay the bills and they should not be given dangerous products. That's just irresponsible. Why not give them to "families" or something other than children? Mercury vapor is incredibly toxic, especially to children. I'm sorry, but anyone who would give a CF bulb to a child is an idiot. It's one product that needs the indestructable plastic packaging. And don't install them anywhere they can be easily broken. A 4-month old girl died when she fell off a couch ... sleeping with her parents and 3-year-old brother on a sectional couch early Thursday because their upstairs bedrooms were cold, police said. It isn't even that cold around here, but families are crowding in the living rooms for heat. Another article announces another NG rate hike. Morley's home is one of 140 in Helena and more than 500 statewide that will get some free weatherization before winter sets in, thanks to the "Warm Homes Montana" program unveiled Wednesday by Gov. Brian Schweitzer. Nearly 17,000 Montana homes are on a waiting list for full-scale weatherization through the Low Income Energy Assistance Program (LIEAP), which gets state and federal funds. The "Warm Homes" program will use Montana Conservation Corps crews in six cities to help whittle down the list before winter sets in. But there's so much you can do on the cheap. I have personaly use a $6 plastic drop cloth and a $2 roll of twine to insulate an attic fan in a friend's home. Air leaks are the biggest problem and should be the first thing you go after. Once it gets cold you can just feel around to spot them. One can also use an incense stick and detect drafts that way. So? She could have fallen off a bed and died. Her death was due to negligence. The Ukrainians have been stealing gas for years as well as paying low rates. The whole reason Gazprom purchased the Polish section of the pipeline around 99-00 ( I forget the actual date) and paid a huge price was to install meters at the borders to find out how much gas was being stolen. Why don't they say "screw your gas, we don't need it" and use something else? Anything else. Electric? Let's say for example, natural gas prices climbed in America and everyone switched over to electric. Then electric rates go up. What then? Solar panels on the roof tops and wind turbines where allowed? Electricity is not magical. Most of it now comes from burning one fossil fuel or another. Your list did not mention coal which is what they will probably switch to the most during this emergency since many coal pechkas are probably still operational. Turkmenistan has signed an agreement with Ukraine to export 40 bln cu m of gas to the country in 2006, said Turkmen President Saparmurat Niyazov, cited by official daily Neutralni Turkmenistan. He did not reveal the price the Ukrainian government will pay for the Turkmen gas, indicating only that it would be 'a little lower' than the 65 usd per 1,000 cu m that Russia's Gazprom agreed yesterday to pay for imports of Turkmen gas to Russia. This agreement with Turkmenistan is very significant for Ukraine, as it is in the midst of a serious dispute with the Russian government over heavy price hikes demanded by Gazprom. Ukraine, through which a large proportion of Russian gas exports transit to western Europe, currently faces the threat of having its deliveries of Russian gas cut off from Jan 1 at 10.00 am Moscow time, unless a new agreement is reached in the dispute. Is there any such thing as a market price for NG in this region? I would like to know how they plan on getting it there without going through Russia. They will go through Russia, the same way that Russia sells to Europe through the Ukraine. It would take pretty fancy footwork for Russia to argue that they can sell to Europe through Ukraine, but Turkmenistan can't sell to Ukraine through Russia. It all depends on if they are willing to exert their direct political/military power. Natural gas suppliers from Austria to England said Russia's decision to halt supplies to Ukraine in a dispute over prices will not disrupt exports to Western Europe. Officials from E.ON AG of Germany, Gaz de France, OMV AV of Austria and Britain's Centrica Plc yesterday said they don't expect disruptions from the decision by Russia's OAO Gazprom to cut gas shipments to Ukraine. Western Europe relies on Russia's state-run OAO Gazprom for about one-quarter of its gas supplies, much of which flows through pipelines that cross Ukraine. The price for immediately deliverable gas on the electronic APX Gas Exchange yesterday gained 9.4 percent to 66.2 pence per therm ($11.40 per million British thermal units) at 10:25 p.m. London time. The contract trades around the clock. Germany gets about 30 percent of its total gas supplies from Russia via Ukraine. France gets about a quarter of its gas from Russia. Britain receives only about 1.5 percent to 2 percent of its gas from Russia. Austrians used 8.6 billion cubic meters of natural gas in 2004, 59 percent of which was from Russia. More than two-thirds of European gas demand is covered by local resources, with the Netherlands, Norway and the U.K. accounting for about 80 percent of western Europe's natural gas production. Additional supplies arrive on tankers from nations including Algeria, Qatar and Nigeria. The Netherlands is ``out of the danger zone'' from the Russian-Ukrainian row, Dutch daily Het Financieele Dagblad reported this weekend. The nation is the only European Union member self-sufficient in natural gas and exports about half its supply. So there is comfort in the near term, but I wonder how these numbers will look in 5 years, 10 years, 25 years as European fields decline? 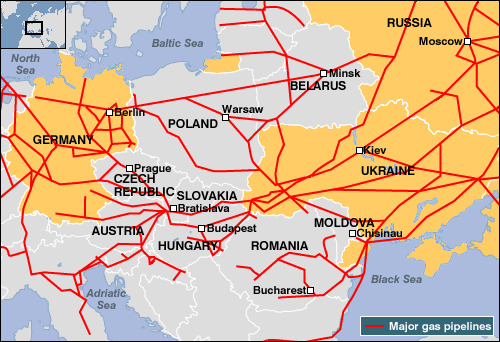 Europe will be more and more dependent of the Russian and Central Asian gas - flowing through Russian pipelines. No wonder Russia wants to raise the prices. One reason for the low "neighbourhood prices" was the lower demand in EU. Russia had surplus gas to sell. Now the European demand and supply situation has changed and is changing further with advancing depletion in North Sea and North America (competing LNG shipments). If we look the production forecasts we see that the Russians will have hard time to offset the North Sea depletion with exports to Western Europe. The Ukrainian idea of market price of $80 is not rational in this context. The Ukrainian government has known all the time that the crisis is coming. Commentators there have frequently hinted that the government knows where there is avalaible gas - "in the transit". Just take it from the pipelines. And let the EU handle this with the Russians. The 15% transport charge in gas is a lot. If the other countries along the pipeline would charge the same, about third or more of the gas would be taken off as "transit payment". The transit costs, maintaining pipelines, pumping etc., do not change with the natural gas price. So it is natural that the Russians want to pay in cash for the transit, not in gas. I think we have here political motives, too. But the main background is the changing energy situation in Europe. This crisis highlights also the fact that much of energy in the whole world is not traded at "market" price or "market" terms. Energy producing countries usually have far lower domestic prices and all kind of discount arrangements (as have the US and the Saudis). This has begun to change and will have considerable impact on the global energy demand. This is similar to what Hugo Chavez is doing in Central America and the Caribean through PetroCaribe. Petrocaribe S. A. is a Caribbean oil alliance with Venezuela to purchase their oil on conditions of preferential payment, launched in June of 2005. The payment system allows for nations to buy oil on market value but only a certain amount is needed up front; the remainder can be paid through a 25 year financing agreement on 1% interest. The deal allows for the Caribbean nations to purchase up to 185,000 barrels of oil per day on these terms. In addition it allows for nations to pay part of the cost with other products provided to Venezuela, such as bananas, rice, and sugar. 12 of the 15 members of CARICOM plus Cuba and the Dominican Republic signed the agreement on September 7th. The nations signing the agreement were Antigua and Barbuda, the Bahamas, Belize, Cuba, Dominica, the Dominican Republic, Grenada, Guyana, Jamaica, Suriname, St Lucia, St Kitts and Nevis, and St Vincent and the Grenadines. The two holdouts of CARICOM being Barbados and Trinidad and Tobago, and also Haiti which was actually not invited to the talks since Venezuela did not recognize the US-led installed government of Haiti. It's also interesting to note that Venezuela is already moving to a barter system for it's oil products. Some Central European states reported a drop in supplies on Sunday, and Austria said the situation worsened overnight. Austria, Hungary, Poland and Slovakia have reported a sharp fall in supplies, and have said they will in turn be pumping less gas to customers further down the line. This is the fear from the UK point of view. We are almost at the end of the line. The weather forecasts for the end of this week and into next week are very cold, in cold weather the UK is highly dependent on daily flows from the continent since we are unable to meet demand on a cold day from our own beach and storage flow rates. The associated high prices and much of the required gas demand destruction comes from gas power stations resulting in electricity shortage. Another update in the situation from Reuters, via Yahoo. Germany warned Russia on Monday that its unilateral decision to cut off gas supplies to Ukraine could harm Moscow's economic relations with the West. Gas supplies through Ukrainian pipelines to Europe started to fall off dramatically, at the height of winter, as a result of the Russian blockade, which has aroused Western fears about insecurity in the energy sector. Russia, which takes over the G8 chairmanship for the first time this month and has sought to promote itself as a reliable energy source, cut its neighbor's gas supplies on Sunday after Ukraine rejected Moscow's demand for a fourfold price rise. Ukraine accused Russia of blackmail on Monday, saying Moscow wanted to destabilize its economy. Moscow accused it of stealing supplies that were destined for Europe -- which Ukraine in turn denied. German Economy Minister Michael Glos, whose country is Russia's biggest gas customer, said Moscow must act responsibly. "Thirty percent of our gas comes from Russia at the moment. That should be increased," Glos told the German radio station WDR. "But it can only be increased if we know that deliveries from the east are dependable." It will be interesting which matters more to Russia, how "reliable" the West views it or how much it wants to retain influence in the former USSR. It will also be interesting to see if Germany cares more about the Ukraine given its need to increase gas imports. The natural gas conflict between Ukraine and Russia is an old one. According to a research institute Clingendeal in the Netherlands, this conflict is allready 10 years old. The core of the conflict is that Ukraine wants to get paid in natural gas for the use of it's pipelines. And the Russians want to pay in cash. For years now, the Ukraine is taking natural gas out of the pipelines for it's own use, claiming it to be the price for transport. And now with the cut in Russian export, it still does, so the customers at the end will feal it. Russia has asked many times before in last couple of years for the EU to help with this conflict, to act as an intermediate between the two countries. Especialy because it concerns natural gas that is being sold to the EU. Offcourse there is a political component here in this conflict; the timing (upcomming elections in Ukraine). And Russia says: "well if you want to be a non-regulated open market economy, you have to pay the current marktet price"
The point here is, what alternatives there are to Russian gas. Central Asia is one, but there is not much more capacity - and the Chinese are doing a lot of bying there. Middle East is another - but the pipelines are not there now and China and India are active also there. And the US. The gas markets are now sellers markets. The Russians will find buyers no matter what. Did you just suggest that the US is a source of natural gas? How laughable. The US exports to Mexico, yes, but it is exporting its Canadian imports. Also the US is inking deals to import LNG (frozen to liquid gas) from Qatar. WASHINGTON, Dec 15 (Reuters) - The U.S. Export-Import Bank approved on Thursday a loan guarantee of up to $403.5 million to support U.S. equipment and services that will be exported to help build a natural gas liquefaction plant and related facilities in OPEC-member Qatar. I pointed to same as you: the US is actively competing with Europe over the gas supply in Middle East, too. So there are no real alternatives to the Russian gas, considering the volumes needed. Reliability does not imply selling gas for a pittance. It is clear here that the west is not going to put any pressure on its new wannabe member Ukraine and let it do what it wants. If Ukraine was only taking 15% of the gas then there would not be 40% pressure drops in some branches of the pipelin on the way out of Ukraine. Russia should sit this one out for as long as possible and let the western club sort it out amongst themselves. It is very difficult to know the real amount of gas involved here. The pipeline system is complex and the pressure drop at some point doesn't tell much. Reserves won't help long - they should be refilled. The Ukrainian demand to get gas at $80 price is not realistic at all. This is also politics. The deal with Belarus is different and involves the ownership of the pipelines - and Russia and Belarus have this principal agreement on a union. One view here is that that the Ukrainian government wants to compel the West to help it economically. The Ukrainian economy has stalled after the "Orange Revolution", partly because of higher oil prices, and the promised help from West has been rather meager. The government can hope to get the EU finance and mediate a deal and show this as an accomplishment in the coming elections. We will see. Now Gazprom has announced that it will restore the supply to the EU. We will see what this means. I wonder if we are beginning to see a dawning realization among energy exporters that it may not be in their long term interest to continue producing their depleting energy reserves--which are increasing in value with time--at 100% of capacity. Our current level of energy usage worldwide--the energy equivalent of a one Gb of oil every five days--simply cannot be maintained. I would argue that energy exporters curtailing their exports represents a win/win proposition. They get more money. We curtail our energy usage, which is going to happen sooner of later anyway, and alternative energy sources become more attractive.. The longer we maintain the fiction of infinite growth, the harder the fall is going to be. Nowhere is this argument more valid than in Ukraine. It is grossly inefficient in terms of gas usage. In spite of all the hysteria, Russia is doing Ukraine a big favor by trying to get it off the gas "crack" habit. It is quite realistic for Ukraine to reduce its annual consumption by more than it imports from Russia. How would they do that? Ukraine has a lot of heavy and energy-intensive metallurgical industry, yes, but it is the most important source of export income. Ukraine is a very typical industrial country, but it uses relatively little energy per capita compared with the EU average or the US. Its Oil consumption per capita is only about 10% of the US consumption. Germany has a population of 82.4 million and consumes about 95 billion cubic meters of gas in a year (http://www.cslforum.org/germany.htm). Ukraine has a population of 47.4 million and consumes 80 billion cubic meters of gas in a year (various BBC reports). Germany's heavy industry, which includes automobile production, accounts for more GDP than Ukraine's total GDP. Germany's total GDP is $2.36 trillion while that of Ukraine is $0.3 trillion (source: CIA factbook purchasing power figures). Ukrainian total per capita energy consumption is 25% lower than in Germany. Ukrainian energy consumption has about halved since 1990. So they have really conserved energy... Do the same in the US or EU. Ukrainian heavy industry is more energy-intensive than German, because it is mostly metallurgical industry, not manufacturing. The steel used in German cars must be produced somewhere. It is easy to boast about high energy efficiency when really energy-intensive production is outsourced. The point here is that energy efficiency is a function of energy used in the past - ie. the infrastructure, machinery, housing, education etc. Well insulated houses need less heating - but it takes more energy to build them. Good roads increase mpg - but require energy to build. Modern machinery are more energy-efficient - but it takes more energy to gather the experience and do the research to build them. Energy efficiency is also a function of energy used now. The good roads are the more efficient the more cars use them (this is optimization - if no cars use them they have no effect, if the traffic is stalled by too many cars, they have no or negative effect). That is why higher energy use is more efficient and long-time high energy use most effective. This means, by the way, that we cannot offset diminishing energy use by increasing efficiency - the energy efficiency will decrease when there i less energy to use. The former Soviet countries are an example of this.